Gaun Seva Pasandgi Mandal (GSSSB) published notification for recruitment of Personal Assistant & Stenographer Posts. Candidates, who want to make their career in GSSSB, may apply for GSSSB Personal Assistant & Stenographer Recruitment 2015 on or before last date that is 14th July 2015. Interested candidates can collect more information related to GSSSB Personal Assistant & Stenographer Recruitment 2015 such as qualification required, age limit, mode of selection, salary package, how to apply, important dates etc from the below segment of this page. Educational Qualification: Graduate in by Govt. recognized university or equivalent / HSC or equivalent. Knowledge of English / Gujarati Shorthand & computer typing. Application Fee Details: Candidates have to pay Rs. 100/- for + Rs. 12/- Postal charges on challan. 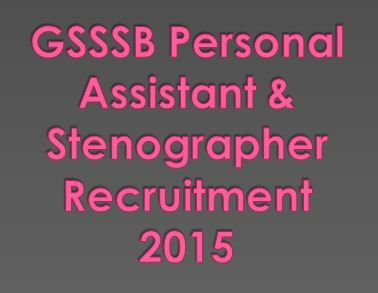 How to Apply for GSSSB Personal Assistant & Stenographer Recruitment? Press on Apply Online tab available at upper side of home page. Follow suitable job link from opened page. fill the Application Form with required details and upload Photo and sign. Take a print out of application form and challan.